Arlington Regional Master Naturalists (ARMN) trains and certifies volunteers for stewardship of the environment. 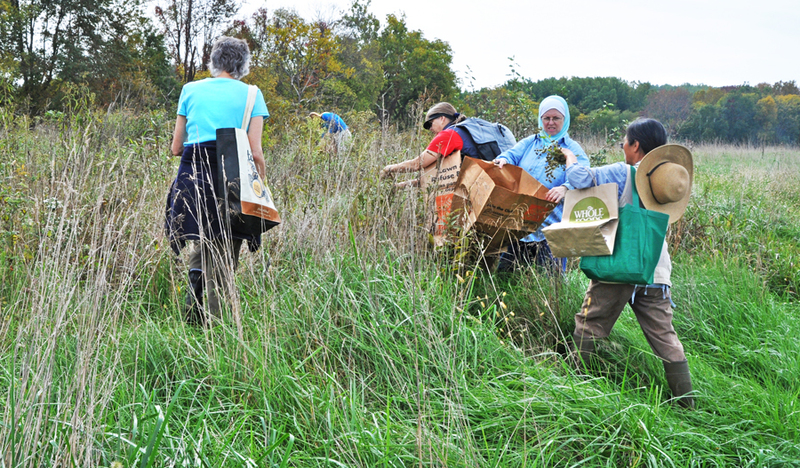 Earth Sangha brings volunteers together to restore native forests and meadows, stabilize streams, and control invasive plant species. The compatibility of purpose between the two organizations could not be closer. In 2011, ARMN designated supporting Earth Sangha as one of its focus service projects. This will continue into 2012. Earth Sangha translated means Earth Community, with emphasis on a deep concern for community. Chris and Lisa Bright, the directors of non-profit Earth Sangha, bring their Buddhist practice to bear on their work. Their mission is to support practical environmental action that expresses compassion for all living things. While its mission is informed by Buddhist practice, Earth Sangha welcomes volunteers from all backgrounds, as does ARMN. One of Earth Sangha’s projects is a Tree Bank that it operates in the Dominican Republic to preserve the native forest. Earth Sangha’s broad ecological perspective does indeed encompass the Earth community. The heart of its work in the Washington area is the Wild Plant Nursery in Springfield, Virginia. Earth Sangha collects the seeds of more than 200 species of native trees, shrubs, vines, grasses, and other herbaceous plants. All of this seed is the local ecotype, meaning the seeds come from plants that have adapted to the local ecosystem over many years. Plants grown from ecotype seed at Earth Sangha’s Wild Plant Nursery supply most of the restoration work in the Washington, D.C., region. A notable project supported by Earth Sangha is the Native Plant Arboretum at the Marie Butler Leven Preserve, a 20-acre park in McLean. Earth Sangha is cultivating an extensive collection of native plants that will eventually form an outdoor botanical library, with plants labeled and keyed to major field guides. At the Meadowood Recreation Area on the Mason Neck Peninsula in southeastern Fairfax County, Earth Sangha is helping to restore forests and meadows over an extensive area. ARMN members are among the many volunteers who participate in these and other Earth Sangha restoration projects. ARMN supports Earth Sangha in other, more particular ways. Twice a year, ARMN co-sponsors a Native Plant Sale at Earth Sangha’s Wild Plant Nursery. For small donations, visitors receive complimentary plants from the 200 species at the nursery. ARMN volunteers and others from the Earth Sangha community have made each native plant sale a notable gathering as well as a great success. In addition, throughout the year, a group of ARMN members and other volunteers cultivate native plants by performing various nursery tasks. In the fall, they also collect native plant seeds in forests and meadows and clean seeds in preparation for planting. All who volunteer in this service find that it is a wonderful way to learn about native plant species and their role in the local ecosystem. To learn about volunteer opportunities at Earth Sangha, subscribe to Lisa Bright’s email listing of upcoming field work: http://www.earthsangha.org/act/sub.html. Or become a member of Earth Sangha and receive emails, plus a monthly newsletter: http://www.earthsangha.org/act/join.html . To receive notice of ARMN’s weekly service activity in the field or at Earth Sangha Wild Plant Nursery, email Rodney Olsen and request to be put on the volunteer list. You will receive email notice prior to Monday and Thursday service days: rfolsen@verizon.net. You do not have to be an ARMN member to join us on these days. ARMN members should watch for other opportunities, such as volunteering at the spring and fall plant sales by following armn@googlegroups.com. This entry was posted in Earth Sangha and tagged community outreach, invasives, native plants, restoration by christinearmn. Bookmark the permalink.